With companies rolling out a ton of tools and apps every day, it is not unusual to find yourself overwhelmed with so many tools aimed at solving very specific recruiting problems. So, what could be the solution? It lies in your favorite recruitment solutions working together. And this is the major reason why Interview Mocha has integrated as Greenhouse.io partners. Where recruiters and hiring teams will have a seamless experience of the best software suite of solutions for end-to-end talent acquisition. Visit our Interview Mocha and Greenhouse Integrations (Greenhouse.io Partners) Page. How does Interview Mocha- Greenhouse.io testing partner benefits you? With the pre-defined Greenhouse.io (partners) integration with Interview Mocha, companies that already use Greenhouse can now choose Interview Mocha's skill test to screen candidates straight from their existing, familiar interface. This will help hiring teams and recruiters to automate the candidate evaluation process and streamline the skill assessment and the candidate’s skill score reports in their existing greenhouse ATS workflow. In short, you can now enjoy best of both platforms in a single interface. Interview Mocha customers who are using or want to use Greenhouse can enjoy all the benefits and features of Interview Mocha from a single platform without worrying to sign up in two different software for applicant tracking and applicant skill assessment needs. A brief about our Greenhouse.io partner: Greenhouse ATS is one of the industry’s most efficient, leading applicant tracking system and has become the fastest-growing provider of enterprise talent acquisition software. How Greenhouse integration with Interview Mocha works? When in Greenhouse, you can easily add Interview Mocha and send test link to desired candidates. Users can access interview Mocha tests and test scores within Greenhouse. For better understanding you can refer the help document: Integration process and Interview Mocha Assessment Stage in Greenhouse.io testing partner stage. Or you can contact us for guidance & support. Why choose Interview Mocha as your Greenhouse assessment partner? With 1000+ ready skill tests and customizable tests made quickly on demand, Interview Mocha has the largest inventory of latest & quality skill tests and aptitude tests. Interview Mocha is a robust, secure, and a sophisticated enterprise-ready platform that companies love. Our customers have improved largely on the quality of hire and reduced employee churn after using Interview Mocha. Eliminate the need for judging by the resumes and assess the real job skills of your candidates. Save time by interviewing only relevant candidates. Advanced analytics and intelligent reports will help you compare and identify potential candidates. Interview Mocha’s strong cheating prevention mechanism can suggest if the candidate has used unfair means to take the test. Your branding and feel while candidates take the test. You can also move candidates to different job profiles in case they perform better in certain job skills or Aptitude. Greenhouse users found it very useful to test candidates’ skills in the initial stage. Greenhouse customer’s (Leading Bank in the Philippines) Hiring Success Story with Interview Mocha who saved 66% of their interview time after using Interview Mocha. With Greenhouse and Interview Mocha Integration, it will be a cakewalk for the Recruiters and Hiring Managers to get a streamlined and quicker process of Recruitment. 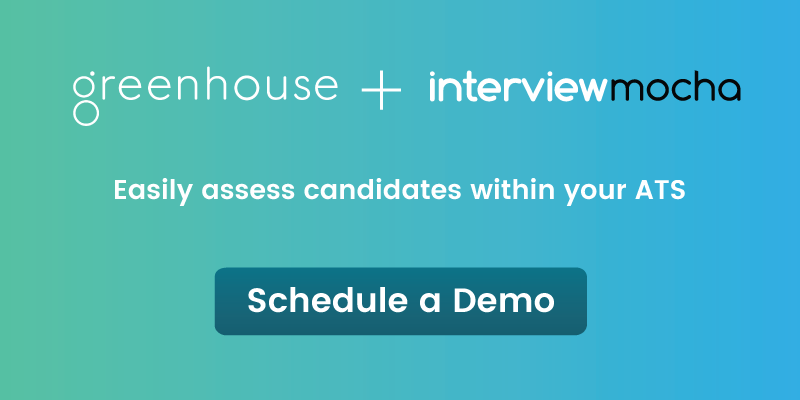 While Greenhouse helps in candidates tracking, you can conduct more focused pre-hire tests and make data-driven hiring decisions with Interview Mocha. It will strengthen the pre-employment skills testing process which will provide more validity and reliability to your hiring process. Interview Mocha and Greenhouse.io Partner up!